Taylor Swift and Cardi B. led this week's Billboard Hot 100 chart at No. 1 and No. 2, respectively. Taylor Swift is leading a group of female artists who are taking back the Billboard music charts. 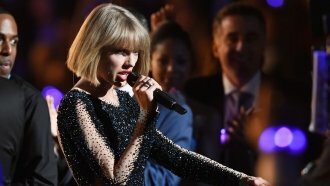 As of Monday, Swift's "Look What You Made Me Do" and Cardi B's "Bodak Yellow (Money Moves)" led the Billboard Hot 100 at No. 1 and No. 2, respectively. The last time two solo female artists took the top two spots on the chart was in late 2014 when Swift's "Blank Space" and Meghan Trainor's "All About That Bass" reigned supreme. Other women near the top of this week's version of Billboard's Hot 100 include Alessia Cara, Rihanna, Nicki Minaj and Demi Lovato. The first three are featured on other artists' songs, while Lovato hit No. 13 with her single "Sorry Not Sorry." Swift's newly released "...Ready for It?" also made the list at No. 4. Men have dominated the 2017 music charts. For the first time in 33 years, men shut women out of the top 10 for one week in April. Take for instance Luis Fonsi and Daddy Yankee. Their song "Despacito" was No. 1 for a record-tying 16 weeks before Swift dethroned it earlier this month. Before that, the last solo female artist to crack No. 1 was Adele with "Hello" back in November 2015. There have been other women to reach Billboard's top spot, but they haven't been singing solo. Most recently, The Chainsmokers' "Closer" featuring Halsey hit No. 1 in November 2016. And Sia's "Cheap Thrills" also led the pack in August 2016 — but Sean Paul sang on the track. Billboard saw a similar drought for women on its albums chart this year. Halsey's "Hopeless Fountain Kingdom" album was the first by a woman to reach No. 1 in 2017 back in June. Katy Perry, Lorde, Lana Del Rey and Kesha have since followed with their own top-charting albums.